Well – Monday was wild y’all. I just felt like my head was spinning by the time the day was over and this week as a whole is going to be eventful in and of itself – I’m headed into DC tonight with a friend for Game of Thrones in concert, I’m having dinner with some of my favorite ladies after work on Wednesday and then it’s home to pack (again) and after work on Thursday, I’ll be Asheville bound for a long weekend to celebrate my upcoming birthday. Whew! We spent last weekend in Williamsburg – we’d originally planned to be there for an air show but my Dad decided about a week out that he’d rather do other things in the area and my Mom and I happily agreed. We arrived around 9:30 on Friday night; Williamsburg is only about 2.5 hours from our house but between stopping for dinner and tons of North Carolina folks trying to get back to their homes, the traffic was a little more hectic than usual. After a delicious breakfast at the Colonial Pancake House (things have to be on theme y’all) we headed over to Jamestown Settlement – a first for me. Over ten years ago we vacationed to the Northern Virginia area and visited Jamestown but the portion we toured was the area set up as a recreation of the settlement, while this time we went to the actual site of the Jamestown settlement and fort. I thought it was absolutely fascinating and was taking it all in from moment one – I love history so much! The fence around the fort. Plaques to John Smith & Pocahontas! The settlement was chartered in 1606 and established in 1607 and was the first colony in North America to be sustained – which was kind of a big deal. 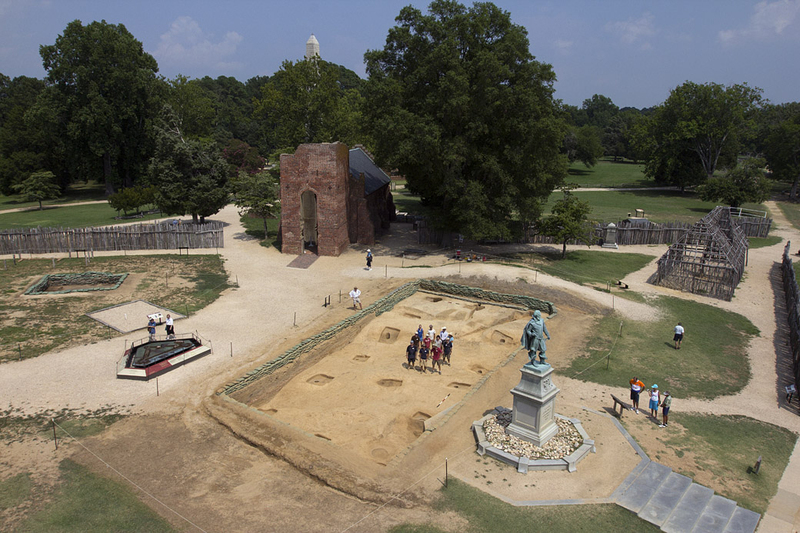 The original fort and settlement was right at the edge of the James’ River and saying that the colony was the first to be sustained is a tenuous use of the word sustained – the colonists struggled to make a good life and while the Powhatan Indians were initially welcoming, that relationship quickly became quarrelsome and wouldn’t be repaired until Pocahontas married John Rolfe in 1614. Posing…just around the river bend. Burials in the church chancel. Monument to all who perished. We listened to a historian talking at length about the “starving time” that took place in the winter of 1609 – a third boatload of colonists had arrived but the colonists already living at Jamestown still had not yet found a way to provide for themselves to sustain through the winter – and now they had more mouths to feed. Archaeologists discovered a trash pit near the church and inside they found human skeletal remains of a 14 year old girl that give clear evidence that the settlers turned to cannibalism in the winter of 1609. The young girl was most likely an indentured servant and so not as “valuable” as other members of the colony – but I cannot remember if she was killed for food or if she died from natural causes… either way – not a great look. I snapped several pictures around the colonies and even grabbed a couple shots inside the museum – until my Dad whispered to me “there are cameras watching you and you aren’t supposed to take pictures…” I thought I was being sneaky and no one ever came to throw me out, so maybe it’s fine? The very first set of remains that was excavated at Jamestown were of a man and the cause of death was quite apparent – because a lead bullet was lodged in his skeleton – he was shot in the leg and bled out due to the injury. After perusing the museum, we walked back through the settlement and I couldn’t resist snapping a picture standing in the exact spot where Pocahontas married John Rolfe in 1614. JR – the first set of remains uncovered. The original foundation of the meeting house. Can you spot the lead bullet? A Native American speaking about culture & traditions. Layout of the Fort at Jamestown. I liked his clothes – very cool! I loved every minute of exploring Jamestown – I usually make fun of my younger sister because she reads so many things but I probably could have poked around investigating things a bit longer. I stopped to listen to the Native American gentleman speaking about the Powhatan tribe and after a few minutes, I looked up to see I’d been left. My parents just kept walking and had moved on to other things, ha-ha! We made a stop on our way out at the glassworks – the settlers tried to create glass to send back to the UK to sell for profit but the venture(s) weren’t ever very successful because the timber they used for fuel never quite achieved the temperature needed to perfect the glass making process. The furnace at the glassworks! I got a wee glass ghost to commemorate our little visit to Jamestown and then we made our way across town to Yorktown Landing and Yorktown Battlefield to have a bit of lunch and look around. We had lunch at a restaurant located at Yorktown Landing (delicious black bean and sausage soup) and walked along the York River for just a bit before visiting the Yorktown Battlefield museum and watching the educational video (wherein my Mom quips “so I guess we won the battle at Yorktown?” *facepalm*). We also discovered a book with George Washington’s Rules for Decorous Living and precisely broke one of them: “do not laugh loudly in public”…because we were absolutely wailing at some of them. A deer at Yorktown Battlefield. Yet another deer – they were everywhere! I like the house number! The house where Cornwallis surrendered. After driving around the battlefield a bit, we drove over to Langley AFB and my Dad took in all the static aircraft displays while my Mom and I hit up the Starbucks. Once he was done snapping pictures, we drove back to Williamsburg to peruse the the Merchant Square shops and snap some pictures of Colonial Willamsburg at dusk – which I did. I’m going to share those photos in a later post but I did want to share a picture of the dessert I had with dinner on Saturday night – a Limoncello Tartufo – it was amazing! We had dinner at Sal’s Italian and the food was divine; something of a preview for Italy in LESS than two months! Oh – and one more thing I love. Remember I said we vacationed to Northern Virginia, DC and the Williamsburg area almost ten years ago? Well when I spotted a fountain at Yorktown Landing, I couldn’t resist plopping down for a photo – even if it was missing something. There’s something…interesting…about seeing a place unchanged in some ways even though ten years have passed. That’s all I’ve got for today guys! Today is the first “official” day of Autumn and I am thrilled! It makes me want to drag out all my scarves, pull on my boots, maybe put a little hat on my head and take a walk while sipping a pumpkin flavored coffee out of my thermos and watching the leaves fall. Granted – as I post this, I’m in Williamsburg and the temperature is hovering around 90 degrees…so if I had on all those things and was sipping something warm, I’d probably melt to death. But next weekend I’ll be in Asheville and the temperatures are supposed to be a wee bit more Autumnal – so maybe I’ll really be feeling it then? Regardless – happy first day of Fall to everyone – enjoy! I’ll be trying to find a location that mimics the picture below…and then I’ll put on my hat, scarf and boots and sip my warm gourd flavored drink, ha-ha! It’s finally Friday! Isn’t that the name of a song? I definitely feel like I can hear that chorus playing on refrain in my head… I know one thing, I’m glad that it’s finally Friday because I’ve got a weekend full of places to go and things to do! One. Colonial Williamsburg – The family is heading to Williamsburg for the weekend and I’m pretty excited. We’ve been a couple times since I moved to Virginia over four years ago (cannot believe it’s been OVER four years!) and I love the whole area. We don’t have any concrete plans but I’m sure perusing the streets of Colonial Williamsburg will be on the agenda and I can’t wait! Two. Jamestown(e) – Another spot that is near to Colonial Williamsburg are the settlements of Jamestown and Yorktown and I don’t believe I’ve ever had the pleasure of visiting either one! We popped into Yorktown years ago when we were on vacation in Virginia but an absolute downpour arrived and quite literally put a damper on the day – so that was that. And while I’m well aware that Pocahontas and John Smith didn’t scamper around Jamestown singing about the “colors of the wind”, I think it will be really cool to finally see the area where they really did interact! Three. 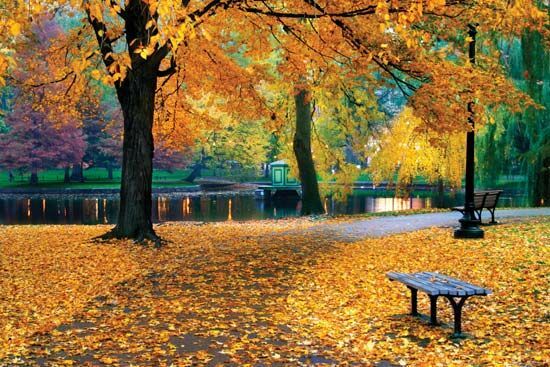 Autumn is Almost Here (Officially) – I don’t know if you’re aware…but the first official day of Autumn is tomorrow! I am (always) ready for cooler weather and Fall fashions – I do feel like cardigans, scarves, jeans, sweaters and boots are really more my aesthetic than shorts and tanks. Hooray for all things Autumn! Four. Game of Thrones in Concert – I am finally getting to use a Christmas present from last year on Tuesday night! The Game of Thrones in Concert has made it to the US and will be back in DC on Tuesday night and my friend Jennie and I are headed into DC for the concert! 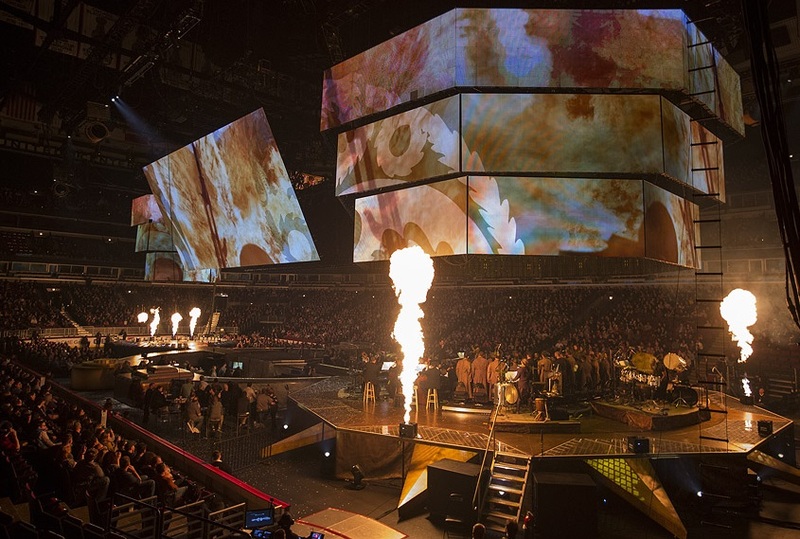 I went to the concert last Spring and it was absolutely fantastic – I cannot wait to go again! I also can’t wait for my friend Jennie to experience it because she is a recently converted Game of Thrones fan (she binged all seven seasons in like…less than three weeks) and I know she’ll think it’s amazing! Five. Pompeii – Today is September 21st and as I was listening to my iTunes while sitting at my desk, it shuffled to a song from the movie Pompeii and the realization dawned on me – I will literally be IN Pompeii on this very day in two months! 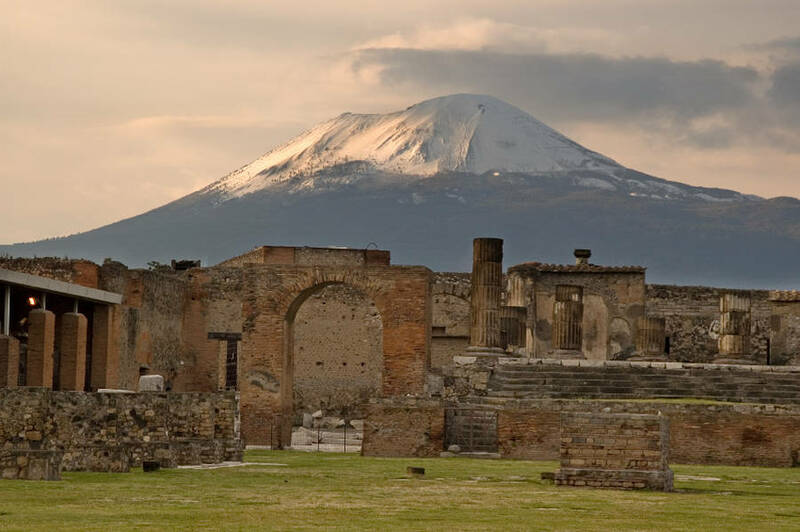 I am so excited to see Italy and explore Venice, Rome and Sicily…but a small part of me is most excited about seeing the ruins of Pompeii! I’ve always been fascinated by the story of Pompeii and the way the violent eruption of Mount Vesuvius so perfectly preserved the entire city. And in just two months – I’ll be walking down those very streets! That’s the five things on my mind on this Friday! I hope everyone has a wonderful weekend and I’ll be back Monday (or maybe sooner) and I know I’ll have plenty of pictures!